On Saturday, 17 September 20R16, Mazagon Dock Shipbuilders Limited (MDL) will be launching the second ship of the Project 15B, i.e. Visakhapatnam Class ships. The second ship is being named as Mormugao and will be launched ahead of schedule. The ship will be launched by Reena Lanba, wife of Navy Chief. Admiral Sunil Lanba, Chief of Naval Staff will be the chief guest for the function. 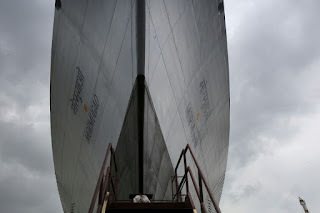 During Launching Ceremony the hull of the ship which is constructed on dry area is floated on water for the first time. It is a milestone event for any vessel. “Indian ship building particularly naval ship building is going for a major expansion and we are having very interesting time. 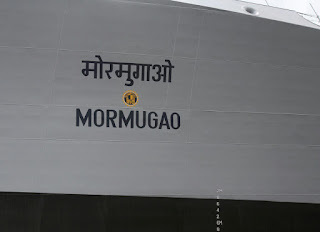 And this will benefit both the PSUs and Private Shipyards”, Vice Admiral GS Pabby, Controller of Warship Production And Acquisition. “In last one year, we have launched 5 major warships, which has been a record of sorts. We are working very hard to achieve the target of launch of 212 ships by 2027, which is a real challenge. But we need to work very hard. We need to find some innovative methods how to achieve this”, said Vice Adimaral Pabby. “I am very happy to inform that number of projects which have been held up for some technical reasons have been given clearance and started moving”, added Vice Admiral Pabby. 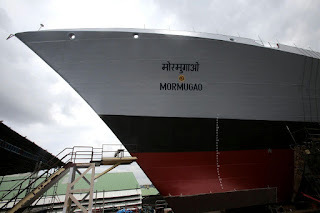 “The length of the ship (Murmugao) is 163 meters. It will displace about 7400 tonnes. The firepower comes from Long Range Surface To Air Missile (LRSAM). For the surface target, it is the surface to surface missile system. It has got Airborne early warning (AEW) radar. Electronic warfare is from the BEL. The stealth has been improved by reducing the RCS by introducing full beam super structure and canted ship side to reduce RCS”, Rear Admiral AK Saxena, Director General Naval Design briefed the media person at Kota House.